Unusual Gift Ideas For Senior SnowsSporters, Becoming An Instructor, Blind Skier Tribute, Walking With Wolves. The Women’s FIS World Cup event at Killington over Thanksgiving showed us: 1) There is real skiing in New England going on right now, and, 2) Mikela Shiffrin won the slalom and came in second in the GS in front of 34,000 enthusiastic fans. While it was balmy on Saturday, on Sunday, the weather closed in, and it snowed on the course for most of the day, making for perfect racing conditions. Mikela certainly has captured the imagination of snow sport lovers and has become an inspiration to a legion of young people who view her has a heroic role model. Here’s the whole story from Vermont Public Radio. 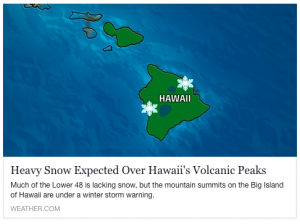 While it snows on Thanksgiving in Vermont, we note that there is also heavy snow coming to Hawaii’s volcanic peaks. We don’t associate Hawaii with snow, but Mauna Kea is more than 13,000 ft. Brave skiers and boarders are able to drive up the summit road and get a run in; there are no lifts or facilities. Skiing in Hawaii in November. Hmmm. Is the climate getting rambunctious or what? From the Weather Channel. The big news this week is that we have published the 2018 Best Skis For Senior Skiers recommendations. We worked with Jackson Hogen of realskiers.com to come with a list of skis for different mountain types and skiing preferences. This is the second year we’ve published this list and it has proven to be quite popular with our readers. Click here to read all about it. This week we also have more gift ideas for our readers. We have tried and tested heavy duty socks made from “Bison Down” and found them durable and resilient, considering that we wore them for five days in a row. Find out why. 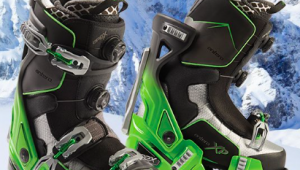 We also highlight the ultra useful DeBooter, a perfect and simple device for helping you remove ski boots. 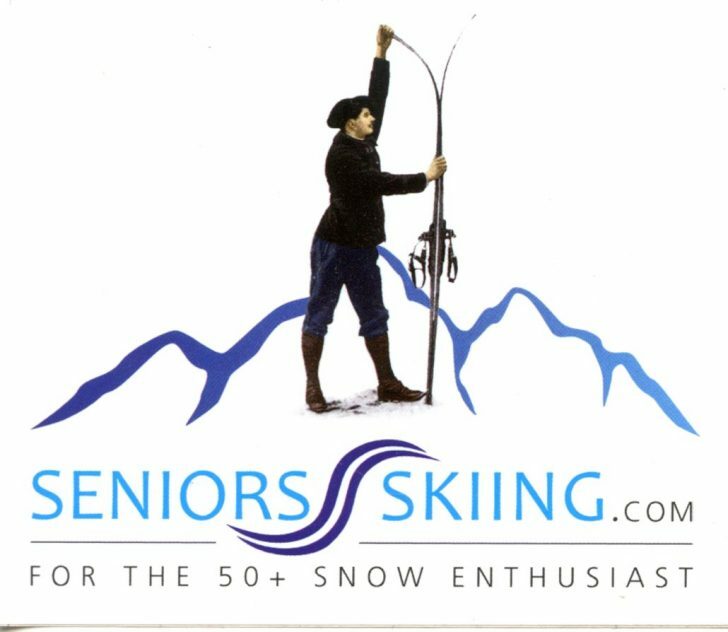 DeBooter is also one of our first and loyal advertisers; SeniorsSkiing.com readers get a discount! Correspondent Tamsin Venn shows us how to become a ski instructor. Think about it; you have the experience, the skills, the time and interest in spending more time outdoors and mingling with kindred spirits. Why not consider becoming an instructor? Tamsin offers 10 good reasons to just do it. Pat McCloskey pays tribute to Fast Freddie Siget, a skier who continued to enjoy life and skiing despite the devastating injury that blinded him. There’s a lesson to be learned from Fast Freddie. Thanks for sharing it with us, Pat. Finally, we hear from Yvette Cardozo, our correspondent in the Northwest who finds that walking in the woods with wolves isn’t as bad as Little Red Riding Hood makes it out to be. 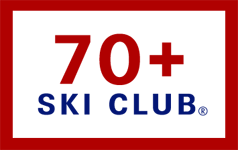 Next week, more gifts ideas, news about Ski Recommendations for Seniors and perhaps some fun with retro ski clothes. OUR LIST OF 115 RESORTS WHERE SENIORS CAN SKI FOR FREE (OR ALMOST FREE) CAN BE FOUND UNDER THE COMMUNITY MENU PICK IN THE BLUE MENU AT THE TOP OF THIS PAGE. LOOK UNDER SUBSCRIBER-ONLY CONTENT. If you want an excellent and free bunch of stickers from SeniorsSkiing.com, send a self-addressed, stamped envelope to SeniorsSkiing.com, Box 416, Hamilton, MA 01936 and we’ll send some. Remember, dear readers, there are more of us every day and we aren’t going away.